Seated in the petite yet well-ordered studio on the fifth floor of L. V. Prasad eye hospital is this celebrated yet poised artist Surya Prakash, who adroitly converges art with science. His paintings echoing the tranquillity of nature through a window like projection across the hospital and bringing a fresh desire to relive lost days for those perceiving vision anew. The coruscating contours in his paintings is charted in almost six decades of his work and is unlike any abstract realism experienced before. The veteran artist’s core subject has always been infinite nature, but none of his compositions is the reflection of any existing reality, instead every inch of his canvas brings forth sublime surprises. The prolific lush grass, the rapture of moonlit sky, the grandeur of mighty mountains, the opulence of dazzling sunlight, the stillness of drenched forest after rain and the rejuvenating streams of water, all point towards artist’s connection with abstract expressionism. 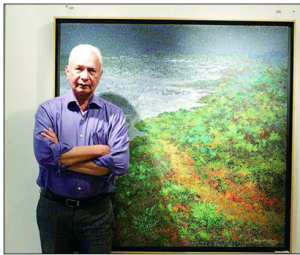 The renowned European impressionists Van Gogh, Pissarro and Monet’s works and their lives were his inspiration in his formative days, says the graceful artist Surya Prakash. Born in 1940 in the Cherukumalli family of Madhira, the then princely state of Hyderabad, young Surya Prakash was awestruck by the serenity of landscape that encircled him. He spent most of his playtime discerning everything that nature had to show off, which kindled his dormant artist waiting to spurt out one day. Although, he held his first brush during his school days, it was during his college days in the College of Fine Arts and Architecture, Hyderabad, that he mastered the art of creating abstract pictorial pleasures through his pointillist brushstrokes. With a diploma and an advanced diploma in painting, he soon landed a government job in the Department of Information and Public Relations, Andhra Pradesh as a staff artist. However, his powerful longing to be an independent artist and his love forart made himquit his comfortable job. Soon with a financial grant from Andhra Pradesh Lalit Kala Akademi, he moved to Delhi to pursue training from the legendary artist Ram Kumar for six months in Delhi. Back in Hyderabad, the then emerging artist Surya Prakash equipped with his priced camera, spent a significant chunk of his time capturing the unheeded metal bodies of automobiles, discarded in an eerie junkyard. With a creative precision, he articulated the images of auto junk into an aesthetic and meaningful artwork, which led to the creation of his inimitable art series ‘Jargon of the Junk’; perhaps symbolizing the sordid lot of the society. Through this series, he astonished the onlookers with his choice of colours and its style of application to the canvas, which is extremelypensive and captivating. His subsequent series ‘Flight’, portraying dead and abandoned dried leaves trying to glide high above a barren land, attracted a huge appreciation. These leafy forms were as lifeless and desolated as the overlooked automobile junk, yet they were once alive and were close to nature, somewhere signifying the limitation of life and the redundantvanity held by the living. With his characteristic diction, he created the very famous series ‘Pool of life’, illustrating the verdant vegetation of lost landscapes in the modern world, with the fusion of exceptional colours, meticulously layered one over the other. His other works like the series on Venice, was inspired by the heavenly streets of water and his boat rides in this‘floating city’. With a brush and a knife, he created this whole series into a pictorial realism for those who missed to experience or wish to recall the quietude of this divine city. His paintings are a visual treat to the beholders with exotic colours and textures, which are regarded across the globe with boundless admiration. He is the recipient of myriad awards including the National award from Lalit Kala Akademi, New Delhi. He has tirelessly led many art workshops and curated numerous art works for several organisations. He is also the brain behind the striking makeover of the walls and campus of Centre for Cellular and Molecular Biology, Hyderabad. Despite all the achievements, he is a man with immense humility, with a childlike desire to learn and experiment with his work. He says whatever he is today is because of his art and that he constantly challenges himself to produce a good work of art on a day-to-day basis. He never slipsanopportunity to interact with young artists and art lovers. His advice to evolving artists is to have a vision and believe in themselves.